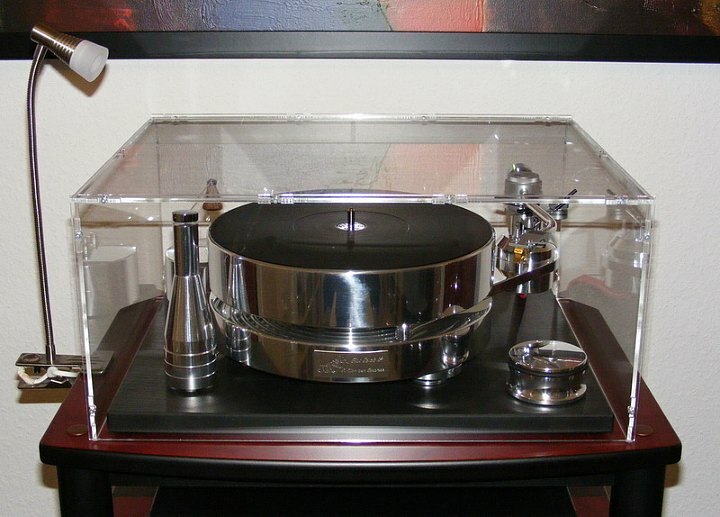 After successfully calculating your turntable cover, you can add it to your cart. If you need more than one item, you can change the quantity inside the shopping cart menu. Product Information "Custom Turntable Cover"
Real audio lovers don’t use just any old record player to play there favourite records. They are only satisfied with models that provide for the highest acoustic pleasure. Unfortunately many high quality turntables don’t come with an apropriate dust cover. Or maybe your old record player’s dust cover just broke and you can’t find a replacement. Now it’s easy to get exactly the turntable cover you need for your player. With this configuration tool you can create your own custom dust cover. Just enter width, depth and height click the „calculate“-button and you like and you will immediately see the price. But there are even more options to choose from. You can decide to order your turntable cover with a matching base – a useful option if you wish to cover your entire record player. Maybe you want a cover with a mirrored or black back-panel instead of the default transparent one. Just select your favourite kind of back-panel in the respective check-box. But what to do if you need cut-outs in the back of your dust cover? You might need at least one cut-out for your record player’s power cord. We have provided for that. If you check the option „Cut-out for cables ?“ you can later tell us how many cut-outs you need and where exactly they need to be. Please tell us about your requirements for the cut-outs in a comment to your order (When you place your order you have the option to leave a comment). The custom turntable covers are based on a connector system. 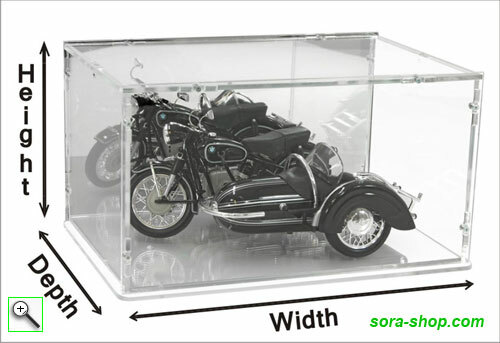 They are delivered as an easy to assemble kit and come with a fully illustrated construction manual. You can get an idea of how it looks when you browse the Construction Manual. The acrylic parts of the construction kit are joined with small countersunk screws (M2.5) and nuts, both with a white zinc surface. The case itself is made from crystal clear 4mm thick acrylic sheets. You can choose between a transparent, a black or a reflective back panel for your individual case. Black or reflective back panels are 3mm thick. 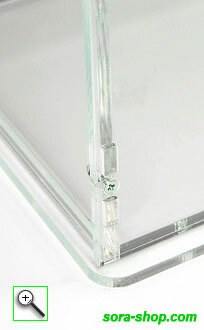 The base consists of two 4mm thick, transparent acrylic panels, which are bolted together. The upper panel’s width and depth match the inside dimension of the cover, so it fits in precisely. The lower panel measures 1.5 cm bigger on each side and has rounded edges. „Flush base“ means that the outside of the lower acrylic base is just rectangular and flush aligned with the outside oft he cover. links to "Custom Turntable Cover"
customer reviews on "Custom Turntable Cover"
This is my second cover, this time for a Lenco L78 custom build and this one arrived in the UK very quickly. It makes the whole set-up look superb. Don't be put off by the nuts and bolts, they give the cover an "industrial look" that suits older turntables in particular. I'll be ordering another soon for another project i'm working on. The person I'm building it for specifically asked for Sora cover when they saw mine. First off delivery is exceptionally fast: I ordered on Monday, shipped Tuesday and arrived at my home in the UK on Thursday. The quality of the product is excellent and the price is nothing short of amazing. The normal price for something like this is in the hundreds of pounds. OK, that is for something glued - you can see the screws that hold this together, but I'm more than happy with the appearance. Assemble is very easy, probably only took me 15 minutes. One tip (that's not mentioned in the instructions) is that the screw holes outer faces of the case are countersunk so that the screws sit flush. It's pretty obvious, but would be annoying if you didn't notice and got a couple wrong. I've also added foam pads to the bottom inside corners of mine as my turntable has a stone base and I didn't want to scratch the case. My Nottingham Analogue Space Deck looks fantastic in its new home. The rather expensive cartridge is protected from knocks and no more dusting. Fantastic dust cover of very nice quality. Even comes with a screwdriver. This was ordered, built and arrived in less than a week. WOW!! Such nice quality I am trying to think what else I need one for. Superb product and excellent value for money. I bought mine to cover the whole turntable and plinth of my Lenco L75 and I'm not disappointed. It looks great. Very easy ordering and spot-on communication with the manufacturer. Very quick delivery and easy to follow assembly instructions. Have been looking for a dust cover for my turntable for several months, found SORA-SHOP almost by accident but so glad I did! Easy ordering process with great customizing options all part of the service and order acknowledged very quickly. Fast dispatch and delivery with the added bonus of easy assembly and a very clear instruction manual (in English as well as in German). Be careful and take your time when building, the result is a great looking cover which really enhances the look of the turntable. Very highly recommended - in fact "spitzenklasse" is a perfect description: thank you very much for a wonderful product. Really pleased with the purchase, fantastic case for my LP Record player, expertly made to order and I found it very easy to assemble. Delivery was quick and the customer service was excellent. I have recommended your company to others and will be purchasing from you again in the future.